Pence: "I don't want to create any false hope"
INDIANAPOLIS -- Gov. 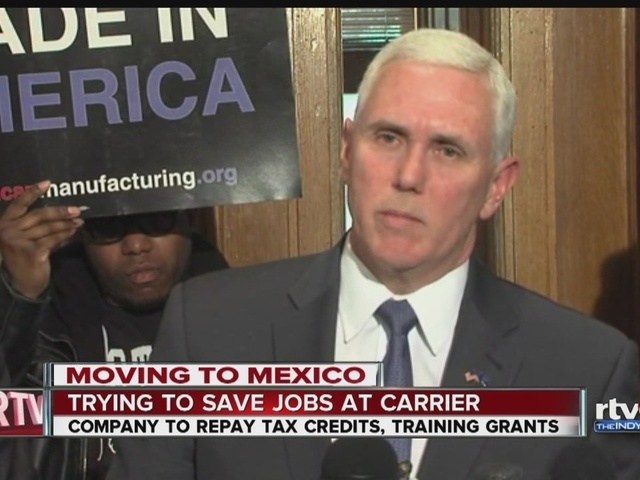 Mike Pence says Carrier and UTEC will reimburse the state around $382,000 for training grants the companies received prior to announcing they were relocating jobs to Mexico. Both Carrier and UTEC are units of United Technologies Corp. The company will also return $1.2 million in tax abatement to the Metropolitan Development Commission in Indianapolis. The governor announced the news at a press conference he held after meeting with Robert McDonough, President of United Technologies Climate, Controls and Security, at the Statehouse Wednesday. Watch the entire press conference in the video player above. "I was very disappointed with the way this was handled by the company and I expressed that to them," Pence said. He said the company will keep 400 jobs in Indiana. Pence called the meeting "frank and productive" and said company executives told him the decision had nothing to do with the business environment in Indiana, but that they were frustrated with a "rising tide of red tape" in Washington, D.C.
"We reiterated our commitment to be a part of ongoing discussions, if there is any way to save these jobs in the state of Indiana, we told the company that we're ready to partner with them, we're ready to work with them, we're ready to sit down and find a way to do that," Pence said. The meeting lasted more than an hour. "Absolutely a positive discussion with the governor. We're talking about next steps and how we move the transition for our employees along," McDonough said as he left the meeting. "As you know we are continuing to have a large presence in Indiana, and we love Indiana, we love doing business here, really positive economic and business climate," he said. As McDonough was walking into the meeting, our Rafael Sanchez asked him if he would work for $3 an hour. "Looking forward to discussing with the governor. The transition for our workers and getting back to business," he said. Watch the interaction in the video player below. Several Carrier employees and members of the United Steelworkers union were outside of the meeting. They said they will ruin Carrier with protests and other actions if they do decide to move to Mexico. "We're not going away quietly. We didn't pick this fight," United Steelworkers Local 1999 President Chuck Jones said. In an exclusive interview, Gov. 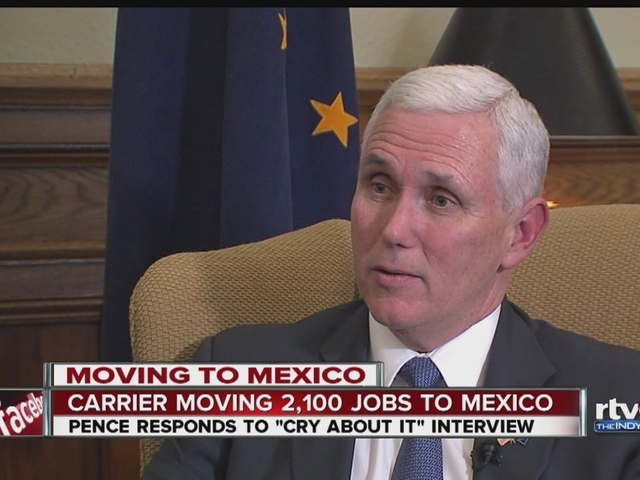 Pence told our Rafael Sanchez that he is not worried about other companies leaving Indianapolis to pay workers $3 an hour. Watch the entire exclusive interview in the video player above. Carrier today met with Governor Pence, members of the Indiana Economic Development Corporation and others to discuss the wide range of factors that informed its difficult decision to relocate manufacturing operations, as well as ways to best support its employees throughout the transition. The productive meeting touched on the continued migration of Carrier’s suppliers and competitors to Mexico, as well as ongoing cost and pricing pressures driven, in part, by evolving regulatory requirements and standards. The company also reaffirmed its intention to work directly with the appropriate state and local agencies to reach a resolution on repayment of tax incentives. Carrier noted that the decision is not a reflection on the positive business environment in Indiana. The company is keeping 400 headquarters, engineering and marketing jobs in the area, and also continues supporting its distributors and contractors who employ thousands of people across the state. 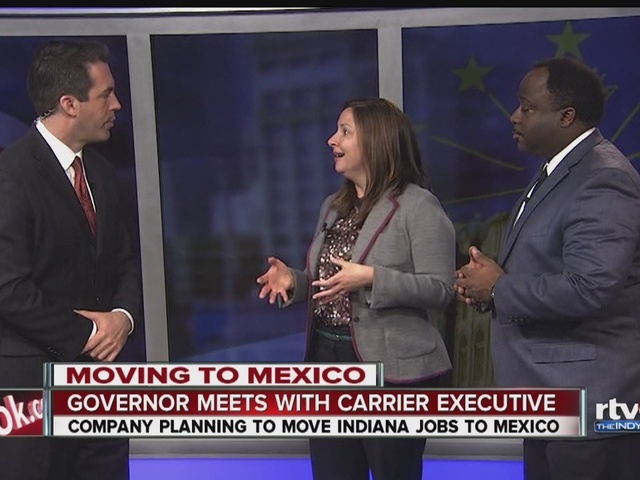 Carrier will continue to focus on constructive discussions with the state of Indiana, as well as with the United Steelworkers to help provide security and certainty for the company’s Indianapolis employees throughout the transition. 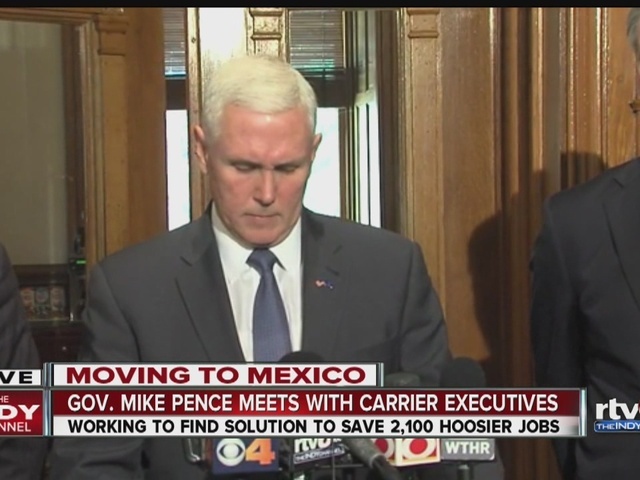 “I read closely Governor Pence’s comments that Carrier told him that red tape and regulations are why it’s moving these Hoosier jobs to Mexico. Carrier previously told me it will still be subject to the same exact regulations in Mexico if the company intends to continue selling products in the U.S. Because the truth always matters, I’m going to press the Carrier executives on this very point when I meet with them.